I love when you get a special surprise, don’t you? 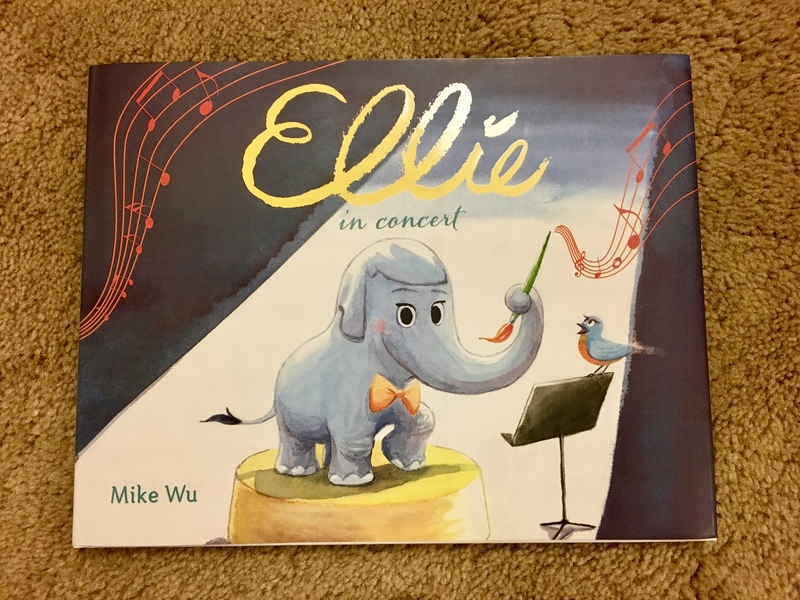 Ellie In Concert is a sweet picture book for young children that continues Ellie the Elephant’s adventures in the zoo. 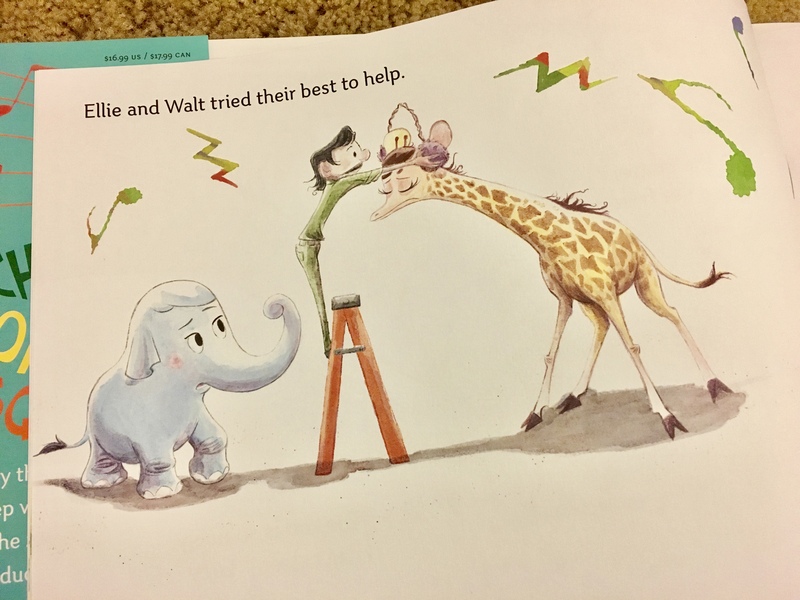 In her debut book, (titled Ellie), she had to use her problem-solving talents to save the zoo, but now that the animals are saved, a new problem arises. Her friend Lucy can’t get any sleep! The animals all make unique noises but in such an inharmonious way that the sounds clash in Lucy the Giraffe’s ears. Ellie is determined to help her friend. But when conventional ways don’t work, she turns for inspiration high above and finds the solution! Mike Wu follows up his first book which focused on visual arts and this time follows up with a book that focuses on musical arts. I can’t help but wonder where his mind will drift off to next – musical theater? If he does, I’m sure he’ll find a creative way to express that medium, too. Ellie In Concert is a cute book. The art is cute, the story flows well with not too many words and not too few. It is a good, solid picture book. But what puts it over the top is – believe it or not – is the JACKET OF THE BOOK! 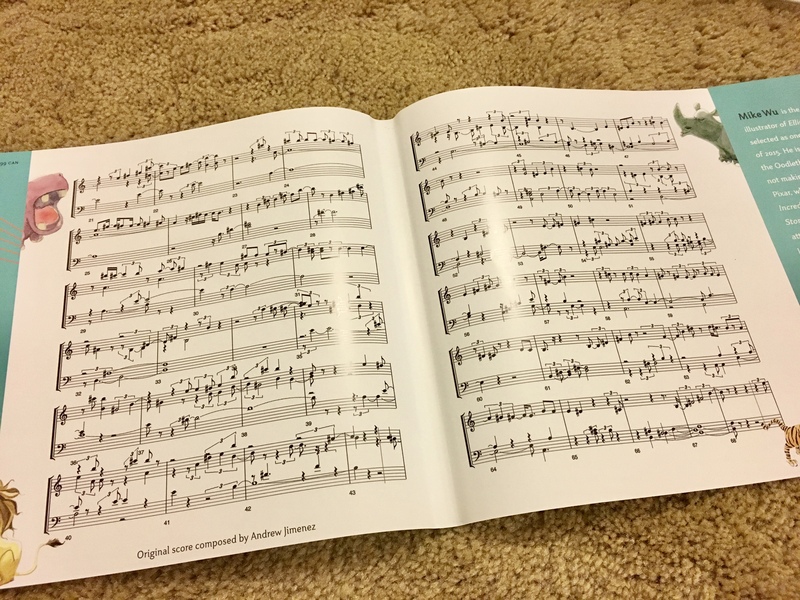 I accidentally slipped the cover off the book and on the INSIDE of the jacket was the complete score for the melody that Ellie composed (original score actually composed by Andrew Jimenez). I’m not very good at reading notes, but when I showed it to my musical daughter, Emma, her eyes went wide and she loved it. Now it’s not likely a 3-5 year old can play this level of sophisticated music, but who am I to say? But if you can play, your child will probably think this is the greatest book EVER! Could this be a Walt Disney homage? One interesting observation is the zookeeper is named Walt. As in Walt Disney. He even has Walt’s mustache. However, I can’t find evidence Walt ever played the saxophone, but still it makes sense to make Walt the leader of the zoo and I wonder if Mike did that intentionally. Having not read the first book, I imagine Walt is in both from the casual way Mike introduces him. But if it is an homage, it’s a nice one. Reminiscent of Dr. Seuss’ If I Ran the Zoo and If I Ran the Circus. A really fun book, especially for the musically gifted! Previous Previous post: Star Wars Rebels The Story So Far….